Fish oil supplements tout their ratios of DHA and EPA. But how do you know how much EPA or DHA you need? If you’re looking to support and optimize brain health, go for the highest ratio of DHA to EPA you can find. While EPA tames inflammation, DHA is known for boosting brain health. Both DHA (docosahexaenoic acid) and EPA (eicosapentaenoic acid) are omega-3 fatty acids found in cold-water fish such as salmon, sardines, herring, mackerel, black cod, and bluefish. Omega 3 is also in vegetarian foods such as nuts and seeds in the form of alpha-linolenic acid (ALA), which the body ideally converts to EPA and DHA. However, some people do not convert well due to high blood sugar, certain genetic variances, or a diet high in omega 6 oil (i.e., fried, snack, and restaurant foods). A unique and powerful source of DHA is algal oil, produced from organic microscopic algae farms (fish eat algae in the ocean). Studies have shown that algal oil imparts the same omega 3 levels as fish. Additionally, algal oil means less demand from fishing practices that have already gravely depleted fish populations and avoiding possible contamination with mercury and other toxins that accumulate in fish. Most omega-3 supplements come with one-to-one ratio of DHA to EPA. A high ratio of EPA is great for managing inflammation, such as from aches, joint pain, autoimmune flares, or skin conditions. A high ratio of DHA has been shown to help support issues such as depression, mood swings, bipolar symptoms, poor memory, and cognitive decline. Look for a 4-to-1 ratio of EPA to DHA for brain health. Some products go as high as 10-to-1 and 24-to-1. DHA is vital to the health and integrity of neurons. It allows neurons to be fluid and flexible, ensuring good communication throughout the brain. This keeps the brain vital and active and inhibits brain degeneration. DHA also improves short- and long-term memory, reduces brain inflammation (which speeds ages of the brain and causes myriad symptoms such as brain fog and depression), and enhances overall quality of life. The blood-brain-barrier is a cellular membrane that lines the brain, protecting it from bacteria, toxins, and other pathogens while allowing necessary compounds in and out. Leaky brain is common and inflames and degenerates the brain. People typically need more fish oil than they think to obtain sufficient omega 3 fatty acids, especially if they eat too much omega 6. One study recommends 3,500 mg for a person eating 2,000 calories daily. 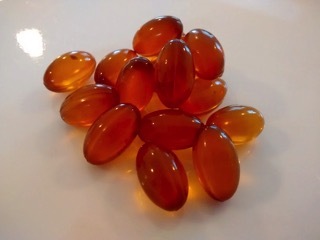 This is four to six capsules of fish oil a day at 1 gram each. Because DHA and EPA are more concentrated in algae, the recommended dose of algal oil is about half that of fish oil at two to three grams a day. If you take a blood-thinner talk to your doctor first.